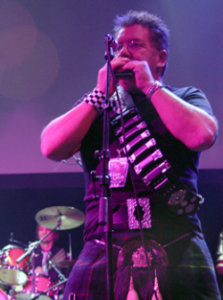 On Karma Chameleon Lander uses exactly the same style of harp as Church Of The Poison Mind, but this time the harp enjoys greater presence throughout the song. 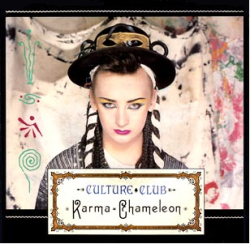 The harp parts comprise that signature Karma Chameleon intro riff, two chorus fills, a lead break after the ‘middle 8’, a third chorus fill and a final chorus outro fill. You’ll need an Eb major harp to play in Bb major cross harp. As you work through the tab below, be aware that Lander likes to ‘scoop’ into certain notes for effect. In our tab, an italicised note linked to a regular note indicates a scoop. This pattern is repeated to complete the first chorus contribution. The lead break starts low down in draw 1. Lander uses a Sonny Boy II style wah-wah on the first note, a bent draw 1 into a straight draw 1. And the song fades. And there you have it! There’s a loving in your eyes all the way. Here’s the video on Youtube, and before you ask, no that’s not Judd Lander on harp. And I don’t believe Boy George really plays harp either! Red, gold and green. Red, gold and gree-ee-ee-een. See also our coverage of Judd Lander on Culture Club’s Church Of The Poison Mind. And here’s a word from Judd himself!